Nine months ago, the Southeast Missouri State gymnastics team was in turmoil. 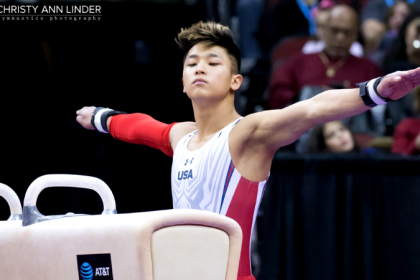 It didn’t have a permanent head coach, the roster was down nine gymnasts—including the two graduating seniors—and rumors of the program potentially being cut circulated social media. But the first signs of things beginning to look up came in mid-August. Alumna Ashley Lawson (née Godwin) was named head coach of the Redhawks, giving stability to the once-great program and succinctly squashing any remaining disbanding rumors. The situation created perhaps the most uncertainty for the freshmen, who were recruited by one coach, signed National Letters of Intent for another and eventually arrived on campus to be led by a third. One newcomer put in this position was Anna Kaziska, a Louisville, Kentucky, native, who became an immediate star for the Redhawks. 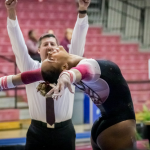 Kaziska’s standout year culminated with a trip to the NCAA regional championship in Baton Rouge, Louisiana, as well as three top-five individual results—finishing second on both beam and floor—at the USAG National Championships in Bridgeport, Connecticut. However, these outstanding accomplishments cap off a year that was anything but. Sure, the team had a solid footing in terms of leadership, but that’s really where the luck stopped. Some of the hardship came in the form of injuries. 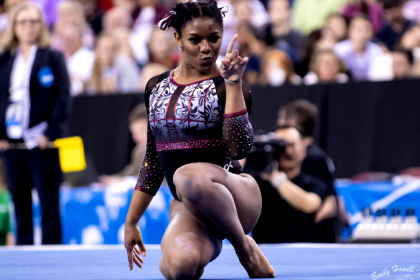 In the heart of the season, SEMO only had eight—and only eight—healthy bodies able to compete while having to put up at leave five on each of the four events for a full team score. Most teams are able to play with 12-plus. Lawson even had to convince one athlete to come out of retirement to field a full slate of lineups. Holding the team together through such turmoil isn’t a task just any first-year head coach could have managed. But Lawson had unknowingly spent the years leading up to 2019 preparing. She spent a year as an assistant coach at Lindenwood, helping the young program to some of its biggest successes. It’s really the lessons she learned at Lindenwood that helped her lead SEMO in this transition year, keeping the team’s spirit high despite all the reasons to give up. The biggest of those was the importance of creating a culture that every gymnast wants to buy into. It might have taken them a while, but the Redhawks are finally getting there, rounding our their 2019 season by eclipsing 190 for the first time all year at the conference championship. They’re hoping that things will continue to go up from there.